I’ve been an on and off collector of seashells all my life. It’s not that there was a time in which I didn’t find the shape of a seashell the most beautiful one on Earth, but as I became more minimalistic I preferred to keep a hardcover encyclopedia of seashells in my home library rather than gather even more seashells. But these days I decided to combine the seashells I already have into delicate sculptures or simply to decorate household objects with them. I’ve seen my share of kitsch seashell crafts. Just because one seashell is beautiful, it doesn’t mean that adding lots of them on an object will somehow impart aesthetics to it. So I’m now trying to use my seashells in such a way that their beauty would be underlined rather than diminished. If all goes well, I could even have a photo book series in plan with my best creations. Until then, here are the top seashell craft books I could find. While not exactly a seashell craft book, if you’re an absolute beginner regarding seashells I highly recommend starting with a free ebook download of ‘Collecting shells in times of Internet’ by Guido T. Poppe, an experienced malacologist (mollusk scientist), shell dealer and multiple book author. Although considered two different markets, seashell collectors and seashell artists intersect all the time and what starts as one ends as the other. What I liked about this ebook is that it gives you some background on the habit of collecting seashells (did you know how many well-known naturalists, including Charles Darwin, were seashell collectors? ), it teaches you what to look for in a seashell to judge its quality and my favorite part: an annotated bibliography with the main niche books and magazines on seashells (I had no idea there were so many, do you know how long my book wish list is now?!). The final part with photos of seashell collectors worldwide can serve as inspiration as to how they organized their (growing) collections. In most cases, I noticed their collection occupied one cabinet only. Sometimes even less if collecting microshells. On my last trip to the seaside, I picked up a tiny bag with sand and as I got home, I’m mesmerized by the beautiful and tiny microshells I found there. If I’d have a microscope, I may find even more beauties. Maybe I’ll rent one when I’ll have sand samples from several places worldwide. Coming back to books containing seashell craft projects, ‘Shell Art: A Handbook for Making Shell Flowers, Mosaics, Jewelry, and Other Ornaments’ by Helen K. Krauss is quite an old book on a topic that still captures the imagination of people living today. It was published as hardcover in 1965 and paperback in 1976. If you prefer written explanation rather than catchy photos and drawings, this book could be just what you need. It’s still a good reference book on how to combine seashells into 50 types of branches, foliage, flowers and many other ornaments. Since it was published so long ago, there is a good chance you could find it in libraries. Alternatively, you can find it used on Amazon and Barnes & Noble as I couldn’t find it in the publisher’s store anymore. Available only in hardcover and published in 2002, ‘Shell Chic: The Ultimate Guide to Decorating Your Home With Seashells’ written by Marlene Hurley Marshall with beautiful photography by Sabine Vollmer Von Falken is more like a coffee table book for inspiration rather than a collection of tutorials, although you will find details on the different types of glue to use with seashells. If you have lots of seashells collected throughout the years, there is a big project here you could replicate: a bathtub! Check out the book on the publisher’s website or on the photographer’s one if you’d like a signed copy. Needless to say, you can find it in most other online bookshops. Published as paperback only in 2015, ‘Coastal Crafts: Decorative Seaside Projects to Inspire Your Inner Beachcomber’ by artist, author and photographer Cynthia Shaffer, this book contains lots of detailed, easy-to-follow instructional projects, great photos as well as the basics on working with seashells and other coastal natural materials like sand, driftwood, sand dollars and many others. You can check out the book on the publisher’s website as well as on most other online bookshops. And while not focused on seashells specifically, you can also check out the author’s blog here. A hardcover published in 2001 by Sterling/Chapelle, ‘Decorating with Seashells’ by Anita Louise Crane contains lovely photos and easy-to-follow instructions of seashell decorations ranging from picture frames to flower pots to candles. You can check out this book on several online bookshops like ThriftBooks, Alibris, Barnes & Noble or Amazon. An experienced craft book author, you can check the rest of her books here. Originally published as a hardcover in 1977 by Bobbs-Merrill, ‘Shell Craft’ by talented author Virginie Fowler Elbert was reissued by Dover Publications in 1993 and it is now available as an ebook, paperback and hardcover. This book is a good mix between an introduction to the use of seashells throughout time, a reference on the basics of seashell craft and lots of additional ideas like embedding seashells in resin, doing shell prints as well as several inspiring projects with clear instructions illustrated in black and white sketches. You can check out the book on the publisher’s website or from Kobo, Barnes & Noble, Amazon. Available as paperback or hardcover, ‘Shells (New Crafts)’ by Mary Maguire is a 1998 seashell craft book containing 25 interesting projects with step-by-step photos. I always appreciate it when art and craft books are written by mixed media artists because they bring such a breadth of knowledge and originality to what they write about and this book makes no exception. 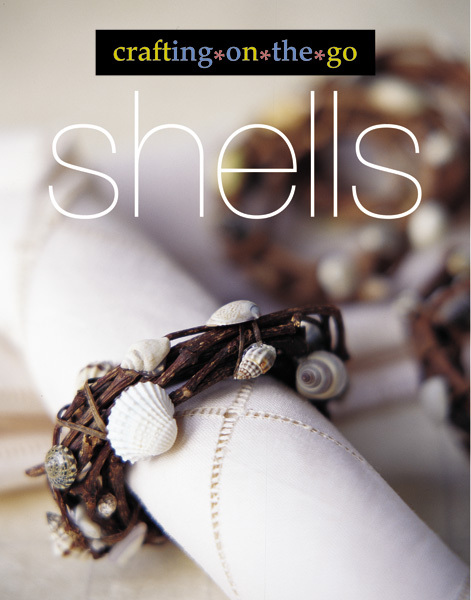 The author wrote lots of other craft books, but this is the only one focused on seashells only. You can check out the book at several online shops including Amazon, AbeBooks and Barnes & Noble. A short paperback of only 20 pages, ‘Best Book of Seashells: Projects for Adults & Kids’ was written by Suzanne McNeill and published in 2010 by Fox Chapel Publishing. It contains instructions on how to clean seashells and which are the basic supplies for this craft. You can check out the book at Waterstones or Amazon. The author wrote lots – and I mean lots – of books on crafts – if you’re curious, you can check out her blog here. Do you know of any inspiring seashell craft book I could add to this list? Tell me in a comment below! *If you are the author and/or copyright holder of a book on seashell arts and crafts, I’d love to review your book(s) on this specific topic on a dedicated blog post. Please send me a review copy by contacting me here! I only do this because I like the topic, so there is no charge or payment involved.